Bed bugs on mattress? Not a great AirBNB review! Get a FREE Inspection. Getting bed bugs not so much. The people who use AirBNB are travelers. They stay in multiple places during a week or a month. They may stay at a property that has a bed bug infestation and then accidentally bring them to your property. As an AirBNB host you can protect your home from bed bugs. Bed bugs on mattress equals an unhappy guest. Keep your reviews positive. Bed bugs have been tagging along with humans from the very beginning. It seemed for a time that the human race was finally able to get the bed bug problem under control but in the last decade the bed bugs have returned in a BIG way. There are steps that home owners, landlords, and AirBNB hosts can take to protect their home and property from bed bugs. Hire a Pest Professional to perform a preventative residual treatment. Install deadfall traps and monitoring devices. In the unlikely event bed bugs get introduced to your home within 6 months of our preventative treatment we will deduct the cost of the preventative treatment from any future bed bug heat treatments we may do on your property! HeatRx has the best equipment and the best training. We partner with the best suppliers and can get you great prices on mattress encasement's, ActiveGuard liners, deadfall traps and bed bug monitoring equipment. We are your partners in the battle against bed bugs. Schedule a Preventative Bed Bug Treatment! We will find a solution that fits your budget and will meet your needs. 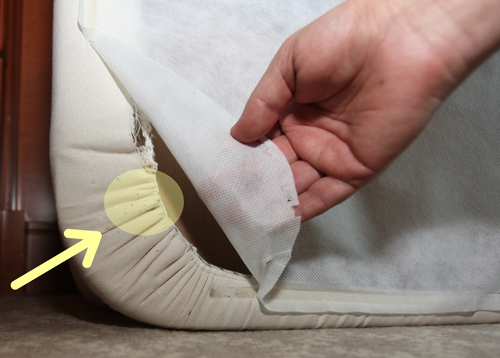 There is never a good time to find bed bugs on mattress. Let us identify the pest and solve the problem! We can help keep bed bugs out of your home. Bed bugs are the worst. HeatRx can get them out of your life fast! We guarantee treatment within 5 days of providing you a written quote!